Profit margins are rather high in the sector, with most businesses financially resilient enough to cope with minor volatility in demand or commodity prices. The Swedish car producer segment is dominated by Volvo Cars in the passenger car segment and by Volvo AB and Scania AB in the truck segment. Those companies are mainly export-oriented (the export ratio amounts to more than 85%), and they largely determine the performance of smaller Swedish suppliers. In 2017 car production increased 10.2% to 226,000 units, according to the International Organization of Motor Vehicle Manufacturers, OICA. Swedish GDP is expected to grow 2.8% in 2018 after increasing 2.7% in 2017, supporting domestic automotive sales. 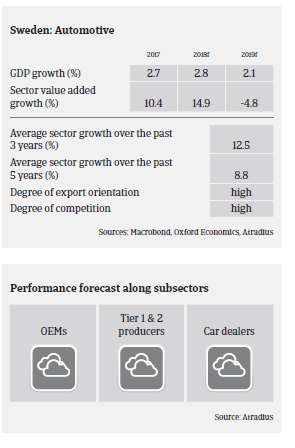 Profit margins in the automotive industry are rather high and expected to remain stable in 2018. Most businesses should be financially resilient enough to cope with some minor volatility in demand or commodity prices. The current interest rate environment (the Swedish benchmark interest rate remains at -0.5%) favours companies in servicing their debt, and banks are willing to lend. Depending on the level in the supply chain, payment duration in the automotive sector ranges from 30 to 90 days. The level of non-payments and insolvencies is low. This is expected to remain unchanged in the coming months. Our underwriting stance remains generally open for this industry, with no restrictions on any subsectors. Due to its high export dependency the automotive sector is exposed to currency exchange risk, as most costs incurred are in Swedish krona. Therefore we check that businesses take adequate measures to manage this risk. A potential downside risk to the economic performance could be the high household debt in case of sharp house price decreases and interest rate increases.